7 Heaven Four chaise lounges, large dining table comfortably seating 6 as well as a separate lounge with outdoor TV are available. 7 Heaven 4 bedrooms with 2.5 baths located on a gulf access canal with western facing view. Electrically heated swimming pool featuring breathtaking sunsets with its western exposure. Westerly view of the swimming pool, water feature as well as the intersecting canals behind the property. Under truss dining area on the lanai featuring 6 chairs and a large dining table. 7th Heaven living room with recycling couch and love seat as well as 2 reading chairs White cabinets as well as an island allow for plenty of room. View from the formal dining room which is located next to the kitchen. The master bedroom features a king size bed, direct access to the pool area and swimming pool as well as direct access to the master bathroom. The master bathroom features dual sinks, walk in shower, a bath tub as well as a walk in closet. This guest bedroom is located at the right front of the house, it features a queen size bed, dresser and 2 night stands. It shares a jack and jill bathroom with bedroom 3. This guest bathroom features dual sinks, walk in shower as well as a separate toilet. The second master suite features a king size bed and also shares the jack and jill bathroom. The pool bath is conveniently located off of the kitchen. Bedroom 4 is located close to the kitchen and faces the front of the home. It features a queen size bed. The boat lift is being occupied by the property owners boat, but the dock can be used for lounging and sun bathing. Front elevation of 7th Heaven vacation property featuring mature landscaping. Bedroom 4 features plenty of natural light. Master bedroom - view out to the lanai/swimming pool. Located in SW Cape Coral, surrounded by stylish homes in a quiet neighborhood, 4 bedrooms featuring 2.5 baths (one pool bath with easy access from the lanai/pool), open concept with vaulted ceilings and an open kitchen with breakfast bar, professionally decorated, over sized lanai with a large swimming pool which is electrically heated as well as solar heated, plenty of room to lounge in the sun, a lounging area has been provided along with a TV on the lanai, private boat dock with boat lift is available and offers more space to relax and fish on, great sun sets as well as intersecting views of the canal can be enjoyed from the backyard. 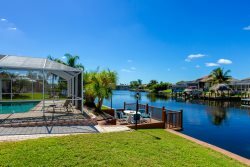 Professionell eingerichtetes und dekoriertes 4 Schlafzimmer 2.5 Baeder Haus in SW Cape Coral, hohe Decken, offene Kueche mit weissen Schraenken und tollem Granit, 2 "Master Bedrooms" mit direktem Zugang auf die Terrasse, grosse Terrasse mit ueberdimensionalem Swimming Pool - Elektrisch sowie Solar beheizt, Lounge mit komfortablen Moebeln sowie Essecke und TV auf der Terrasse stehen fuer Sie bereit, der Gulf Access Kanal mit privatem Bootssteg und Bootslift bietet noch einmal mehr Platz zum entspannen, toller Blick auf eine Kanalkreuzung sowie unvergessliche Sonnenuntergaenge am Abend von der Terrasse welche in den Westen blickt. Our second stay in this property. Highly recommended. Es war einfach groartig. Das Haus ist super und die Gastgeber waren sehr hilfsbereit (Kinderbetten, etc.) und nett. Wir hatten eine tolle Woche in Cape Coral! Nochmals vielen vielen Dank!! Thank you for being a great host and we enjoyed our stay. Your staff was courteous and prompt with our questions. Perfect home for two families. The property was just as pictured. The neighborhood was quiet. I would stay again in a heartbeat. We enjoyed ourselves. The home was perfect for our needs. The home is very nice, spacious and extremely clean. The amenities were nice (including the pool and the outdoor seating areas). The home is very comfortable. Check in was a breeze. Eva communicated appropriately. We would stay her again and recommend you do too! Vanessa was great. There seemed to be a lag in time from our initial request to actually getting things corrected. It eventually was taken care of. Probably more of a contractor issue. And I realize were were there at peak season. Overall everything was excellent. Alles hat hervorragend geklappt, das Vesteva Team sehr kommunikativ und perfekt in Vorbereitung und Durchfhrung. Das Haus war in einem klasse Zustand, alles was wir brauchten, war vorhanden. So beginnt die Erholung sofort am 1. Tag. Der grte Bringer war sicherlich die Pool Aerea. Grozgig, super eingerichtet und der Pool selbst gro, sauber, warm und zum Schwimmen und spielen geeignet. Zu erwhnen sicherlich auch die top WLAN Anbindung. Alles in Allem haben wir eine phantastische Zeit in diesem Haus verbracht. We have been visiting the state of Florida for over 6 years now, sometimes two trips a year for our family vacations. A little over two years ago a work friend introduced me to Vesteva, she had stayed in some homes managed by Vesteva in the past and had nothing but wonderful reviews. I am so glad she had referred me to stay in Cape Coral and check out the company Vesteva. I did, and was I ever glad I did. The homes are very well cared for, so much that this year we rarely seen an ant on the pool deck and not one live cockroach! No joke, but this is true. The homes are wonderfully decorated, extremely clean and above all comfortable, feels as though you are home. The staff are very efficient, kind, and friendly. They go out of their way to make sure your stay goes as smooth as possible. I left an item of value in the home we stayed and Steffen made sure I had received it after I returned home. Very kind and not expected but "thanks" for going out of your way!! We had an issue with a broken bed, and it was taken care of immediately. The maintenance person was so kind and friendly, and had the biggest smile. Sit back, put your feet up and relax, your on vacation...we will take care of it. Of all my years in visiting Florida, I honestly have to say there is no better company to help you with your holidays! You really should book today, you won't regret it!! Whether we are dealing with Eva, Vanessa, Nina or Stephen...they are all very professional, courteous and welcoming. Thank you all so much! I still prefer the Santa Monica home but 7th Heaven was completely up to Vesteva standards. We had a wonderful time! We really enjoyed staying in 7th Heaven . Good quality furnishings,towels and bed linens. Super comfortable beds! Very peaceful area. Loved it! This was our first experience and it was better than expected. Great communication before our stay and during when we had questions. This was our first experience and it was better than expected. Great communication before our stay and during when we had questions. House was immaculate. Plenty of thought given to color scheme and accessories. Everything you needed was provided right down to noodles for a fun time in the pool. We think Vesteva vacation homes is a great company, they took good care of us. It is so simple to book a rental house. Steffen checked us in and out and explained features in the house. My husband and I recently rented 7th Heaven for 2 weeks. The house has very comfortable furnishings. We found out it was professionally decorated with new furnishings and paint. We especially liked the large lanai and pool. We spent most of our time by the pool and loved the refrigerator and t.v. outside. The house is furnished with everything you would need including 2 bikes in a quiet and great location. The house if bright and open. The next time we rent it we will be bringing another couple with us and hope to stay longer since is has 2 master bedrooms. The pool bath is an added plus. We can't wait to come back. Almost forgot to mention how great it is to have surround sound through out the house, especially by the pool.